This vegetable oil comes from the Elaeis guineensis tree and can be found in more than half of all products on the market. It's commonly added to bread, cookies, chocolate, margarine, pizza dough, instant noodles and even cosmetic and household products. Customers can also purchase bottled palm oil and use it in homemade dishes. If you look over these facts, it's easy to understand why palm oil has raised so much controversy. With 106 grams of saturated fat per cup, this food may negatively impact cardiovascular health. According to a 2015 review published in the World Journal of Cardiology, its effects on blood lipids and heart disease are subject to debate. However, researchers say that palm oil health risks shouldn't be a reason for concern as long as this food is consumed as part of a balanced diet. 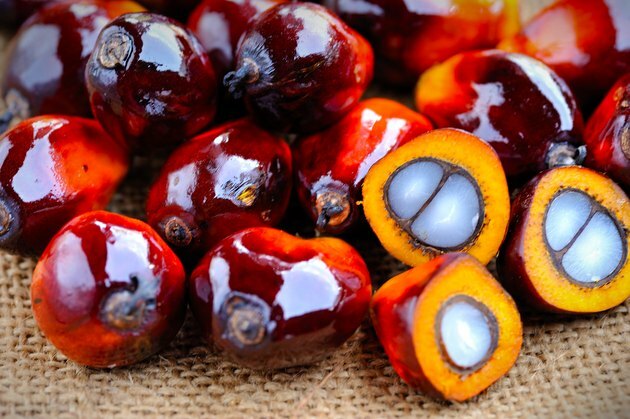 Read more: Does Palm Oil Lower HDL or Raise LDL? Considering this information, it's safe to say to palm oil health risks are negligible. Remember, moderation is the key. If you consume this oil as part of a balanced diet and don't go overboard, you're unlikely to experience side effects. Keep in mind that the American Heart Association recommends that you limit your daily saturated fat intake to no more than 6 percent of your daily calorie needs, which on a 2000-calorie diet translates to no more than 13 grams. Read more: What Are the Benefits of Palm Oil on Hair & Skin? These findings show that palm oil isn't better or worse than olive oil. Despite its high content of saturated fat, it's safe as long as you consume it in moderation. Plus, it's much healthier than refined solid-fat vegetable oils, which are jam-packed with trans fats. Since this oil is _solid at room temperature_, make sure you melt it before adding it to cooked meals and baked desserts. A single tablespoon of palm oil is enough for most dishes, so there's no need to use large amounts. Ideally, choose a brand that's minimally processed and contains no additives.